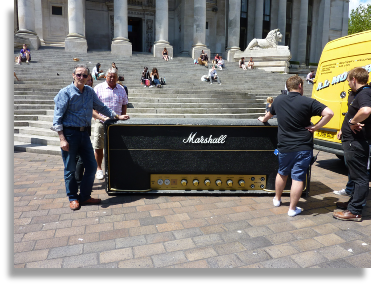 Mike Devereux, Managing Director of Nevada Music (in jeans and blue shirt) kindly donated an oversize model of a Marshall amplifier to the exhibition. It had been on top of racking in his warehouse and had to be cut down to remove it as the business had expanded since the amplifier’s arrival many years ago! 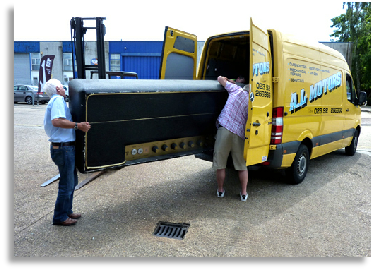 The amp being unloaded in the Guildhall Square. It attracted a lot of interest from passers by. 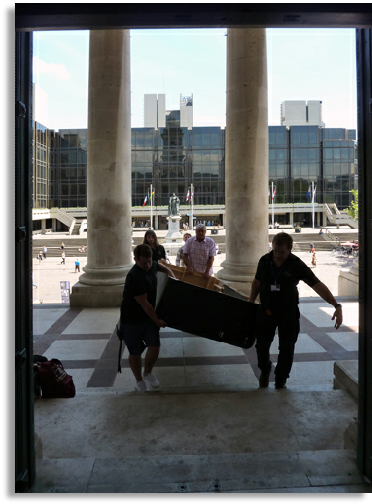 Because of its size the amp had to be brought up the Guildhall steps and through the front doors, probably one of the most unusual objects to have entered through the main doors. 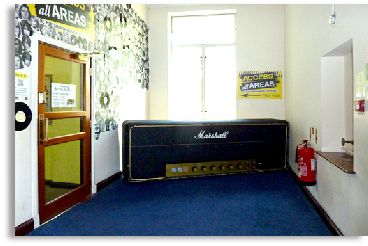 The amp is situated outside the entrance to the exhibition but the Trust are hoping to relocate it above the entrance door. Then the window that once overlooked Verrechia’s coffee and ice cream parlour, fondly remembered by many Portsmouth people, can be accessed and a photograph of Verrechia’s will be displayed nearby.